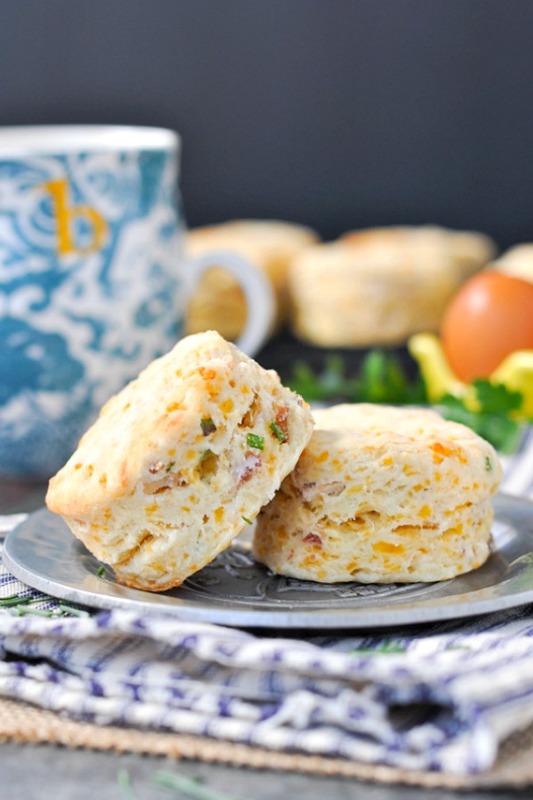 Chive Cheddar Biscuits made with bacon. 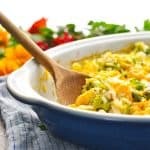 A delicious and easy prep-ahead side dish or breakfast. Cheddar Biscuits with Chives and Bacon are the perfect, prep-ahead side dish for all of your brunches, showers, and Spring celebrations! The easy recipe only requires 15 minutes of prep, so you can bake the biscuits on a Sunday morning to enjoy with your omelet, or stash them in the freezer for a later date! 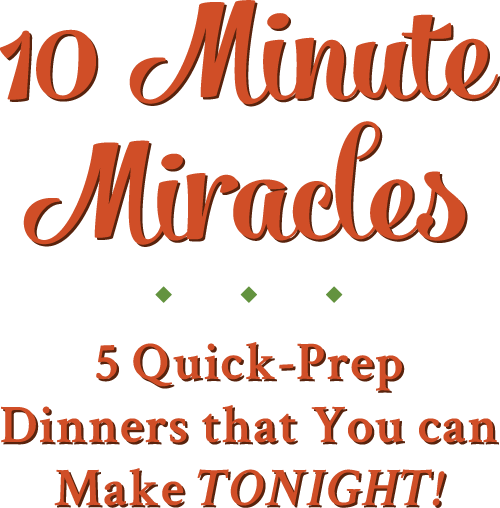 This recipe was inspired by my friend Margeaux, who is one of my favorite recipe sharers! She loves to cook as much as I do, and she’s full of great ideas (remember her amazing coleslaw?!). When she told me about some scones that she had made using cheddar, chives, and bacon, I knew that I needed to create my own version at home. 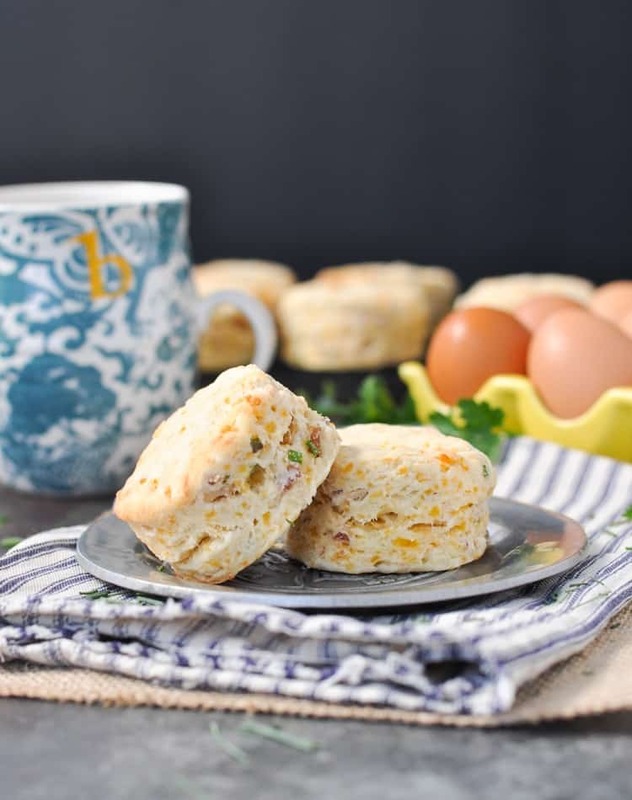 With Easter brunch, Mother’s Day, and multiple baby showers on the horizon, I knew that these bacon biscuits would be the perfect side dish for all of our festive occasions. These Cheddar Biscuits Are Ready In Just 30 Minutes! I also love these bacon biscuits because they are completely nostalgic. I used my dad’s biscuit recipe, which he has been making for as long as I can remember. I have vivid images from my childhood of enjoying the plain version with strawberry jam on Sunday mornings before church. 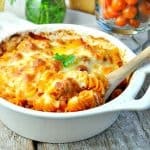 They are 100% comfort food for me because they remind me of my parents! Plus, they just taste really good. They’re not greasy at all, and I love that my boys now enjoy them (with jam), too. I think that GrandDaddy will probably be making a batch for my little guys the next time we visit! In a separate bowl whisk together flour, baking powder, and salt. Use a pastry cutter or two forks to cut in butter (or see note below about using a box grater with frozen butter). Add milk and stir just enough to bring the ingredients together. This should make a soft, sticky dough. If the dough seems too dry, continue adding a splash of milk or cream to the bowl until the dough becomes sticky and forms a ball. Don't worry -- the dough will be less sticky and will come together nicely when it's kneaded on the flour surface and that extra flour is incorporated. Gently fold in the cheese mixture. Pat or roll out dough to ¾-inch thickness. For crisp biscuits, place far apart on an ungreased baking sheet. For fluffier biscuits, place them close together (touching) on an ungreased baking sheet. You can prepare these biscuits in advance and keep them in the freezer until you're ready to enjoy them. To reheat, just place the biscuits in an oven or toaster oven at 325 degrees F until warm. You can even warm them in the microwave! 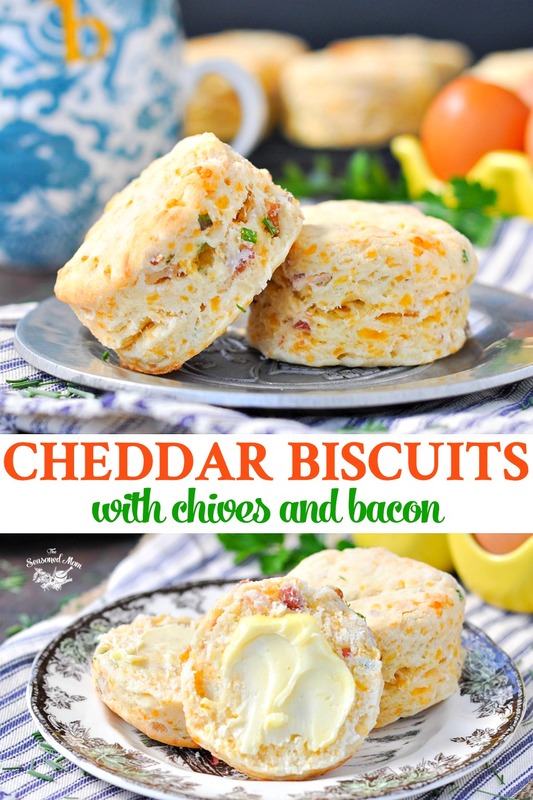 If you don't want bacon or chives in the biscuits, these are also delicious with just the cheddar cheese. TIP: My dad suggests freezing your butter and using a box grater to grate the butter into your flour mixture. This makes it easier to combine with the dry ingredients -- especially if you don't have a pastry cutter. 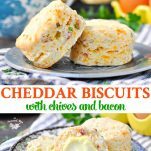 This recipe for Cheddar Biscuits with Chives and Bacon was originally published in September, 2014. The post was updated in March, 2017. Yum these biscuits look and sound awesome. 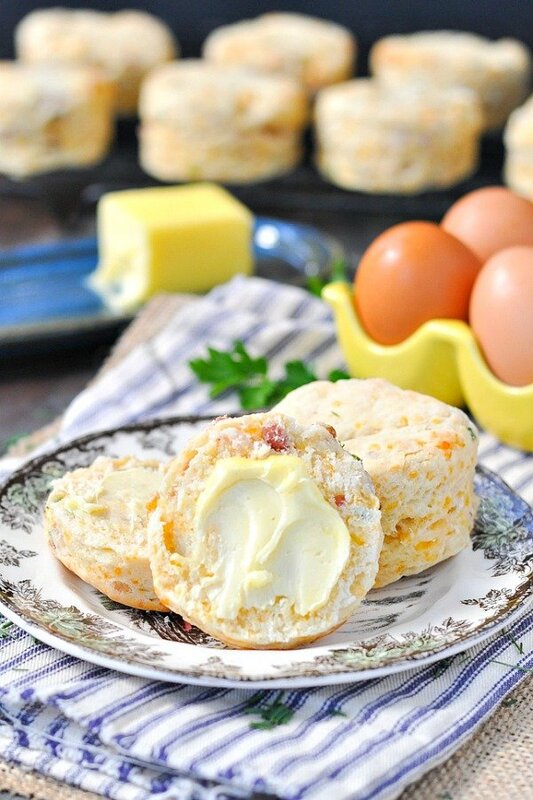 It’s almost like a savory scone…I bet they make great breakfast sandwiches. Joybee…they do make great breakfast sandwiches! We enjoyed them with some eggs, cheese, and extra bacon in between! Can the unbaked biscuits be refrigerated over night, then baked the next day? I’d like to bring them for Thanksgiving dinner with relatives. How would I reheat for a bridal brunch if I bake and freeze? WHERE IS THE BUTTER IN THE DIRECTIONS? Those muffins would be perfect with fall soups! Pinning and sharing! 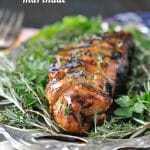 Blair, I love the photos and the recipe. I’ve never made biscuits like this, but I need to. I’m pinning it now. Those donuts look incredible, too. Thanks for the links. Hi, Heather! Thanks for visiting…these biscuits are such a family favorite. Thanks for the pin, and I hope that you get to try them! Hi, Jamie! Thanks so much for stopping by! Oh my gosh these biscuits look so good Blair! I can’t wait to give them a try, I think my family will love them! Thanks, Amber! You’ll love them, and they are SO perfect alongside a bowl of chili! Thanks so much for the pin, Meredith! Thanks for stopping by, Giovanna! Blair, so yummy!! It reminds me of Red Lobster biscuits but with bacon! Delish! Thank you for stopping by Merry Monday. 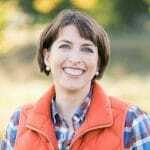 I am pinning to my personal board! My husband would love these. He is a huge fan of Red Lobsters Cheddar Bay Biscuits and yours look so much better, for one they have BACON! Thanks for sharing at Foodie Fridays. Hope to see you there again tomorrow! These look tasty and beautiful! 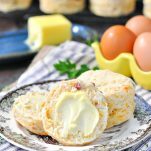 A friend made cheddar bacon scones last week and they were tasty, but these biscuits look far more light and airy. Visiting from Create it Thursday! Definitely making these this weekend! These sound great, I’d love to dip them into soup. Thanks for linking up to Sweet and Savoury Sunday, stop by and link up again. Have a great day!! Have you ever tried these with whole wheat flour? Hi, Melissa! No, I haven’t. 🙂 I bet they would be fine, although maybe a little bit more dense. In general, it seems to work best if you use half whole wheat flour and half AP flour when baking. Another great option is Whole Wheat Pastry Flour, which has a lighter texture and seems to result in fluffier baked goods. I’ve just never tried it with this particular recipe. Let me know if you give it a shot! I made these scones few times and it turned out delicious ! My family love it ! Thank you so much for sharing the recipe. 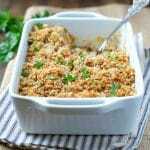 I have shared your recipe on my blog linking back to your blog. That’s awesome, Ruwani! I’m so glad that you liked the biscuits, and I truly appreciate you sharing them on your own blog. That’s wonderful! Have a great week! I don’t understand what you are meaning that I do with the butter? I’ve never made biscuits before, so this is a first! Should I melt the butter and add it? Or add it in chunks? Thank you! PS I rated this recipe as a five because made it in advance and tomorrow morning I will cook them over. Hi, Kim! That’s wonderful — I’m so glad that you find the recipes tasty and that you have figured out how to incorporate them into a healthy diet. I love hearing that! Thanks for your support, and I hope that you have a wonderful day too! 🙂 Enjoy those biscuits! Hey Blair! Do you think this recipe would work drop biscuit style or in a cast iron biscuit pan? Hi, Dorothy! I haven’t tried it drop biscuit style, so I’m not sure. The cast iron skillet method should work great, though!